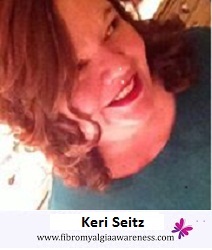 Meet Keri Seitz from WA, USA. Keri suffers from Fibromyalgia but has not let it take the best of her. Her advice to patients as well as doctors really makes a lot of sense. Do read her interview as she talks about pain, limitations, energy boxes and doctors. I had a bad flu. Took me three months to fully recover from it. At the time, I was caring for my mom, who was in a nursing home after having a surgery complicated by a staph infection. I went to my family doctor, who thought I might have depression with pain. I tried various OTC medications, but the pain levels kept climbing despite trying everything available for pain. I thought I was crazy and just went with the idea that depression was causing me to be in pain. At some point, I realized that the pain was different. I started to recognize flare ups versus arthritis pain. I developed a host of new symptoms, stomach problems, etc. I finally went to a neurologist in 2008, who diagnosed me correctly after a battery of tests. She referred me back to my family doctor who has been trying to help me manage symptoms of Fibromyalgia as well as other conditions I suffer from (mentioned below). Since my diagnosis I have tried various medications, but I am unable to take most of them without uncomfortable side effects. I found some relief using a TENS unit, but I soon grew accustomed to it and it lost its effectiveness. I am fortunate to live in a state with a world renowned University hospital. I received my diagnosis fairly quickly, but soon discovered that nothing really puts a dent in it and pain is a part of my daily life. I have learned methods of controlling some of it, but it remains a challenge in every thing that I do. The first thing I did once I received a diagnosis that I could understand was to buy books on the subject, read them and give them to my doctor so that she could help others. Just getting a diagnosis was a good thing. It gave me a starting place, a chance to begin learning about my condition. Yes, it was hard to get to the diagnosis, but there was a sense of relief that I wasn't imagining this awful pain, I have a condition which causes it. Fibromyalgia & Chronic Myofascial Pain: A Survival Manual by Devin Starlanyl and Mary Ellen Copeland. These books have helped me a great deal. The key to acceptance is understanding and I fully accept and am learning more about this condition every day. Since being diagnosed I have discovered that a normal day is around 4-6 on my pain scale. I live for the days when it comes down to a 4! I have almost constant muscle spasms in my back, I have developed food and chemical allergies. Shampoo burns my scalp. I developed allergies to foods I have eaten for years. In the beginning, I used to let my pain stop me from activities I enjoyed, but I have done a great deal of studying up on my condition and know that I MUST keep moving and I do most days. If my pain is out of control, I spend a lot of time resting. Learning to differentiate between arthritic pain and a fibro flare-up has helped in treating myself day to day. Over the years I have had problems with my legs, I fall and that causes me a great deal of pain. The falls frighten me. I have discussed this with me doctor and I am somewhat worried about MS. I have horrid insomnia. I have severe dry eye, and the meds I take cause severe dry mouth. I have learned my limits and respect them, knowing that anything I do is going to have me paying the price in pain if I choose to over do it. I break out in sores all over my body and no one can figure out why. I get sick very easily and the severity and duration are longer than you would expect. I have burning, tingling, cramping pain. It is hard to define. I am exhausted, I am SORE! It sometimes hurts to be touched. It is so hard to describe because every day with this condition is different. Nothing seems the same day to day. Each day brings something new or something better/worse. Fibromyalgia can affect every system in your body. I think that is why they are having such a hard time understanding it, but I believe they will find the answer, and perhaps a cure! Osteoarthritis, chronic fatigue, bilateral carpal tunnel, degenerative disc disease and a general breakdown of my immune system. My inability to go out has cost me friendships, the ability to go see my mom who is very ill, involves my driving for 2 hours and I am no longer able to do that. It has caused me to be depressed and that depression has been a factor in my separation from my husband. I used to be obsessed with my pain and complained constantly. I just didn't understand it, and I was crying out for someone to understand me... help me. I found little information in books and the greatest source of information has come from other fibromyalgia patients. I have a high pain tolerance and I am shocked at just how much pain I can be in and still stay standing. As the years pass, what used to be a 6 on my pain scale is now a 4. You do develop a greater ability to tolerate your fibro pain, but it is always there, always hurting, and it alters your life forever. Because I am home most of the time, it has cost me friendships. My kids are understanding, but my husband couldn't deal with a sick wife. He's a VERY active man (he climbs mountains). I will never be able to do those things with him and we grew apart. We separated in January 2013. It ended it. My Fibro fog could cost someone their life if I typed anything incorrectly into a patient's file. I could not take on that stress and responsibility. None at the moment. I am very much into holistic medicine. If I continue to develop new symptoms that are in line with with a new problem I will go back to a neurologist. I use medical Marijuana, it is legal in my state. I use it in edible form or tinctures. I have been tried on NSAIDS, morphine, prescription pain killers, anti depressants. Just about everything. I draw the line at biologicals. I will not take them. They destroy your immune system and are generally very dangerous. I hate to see them advertising them so freely on the TV. Patients just do not know what they are getting into when they begin taking this type of medication. I can't emphasize enough how important it is to empower yourself with all the knowledge you can find. You are your own best advocate. As long as patients continue to blindly trust their doctors, the less likely they are to become empowered enough to ask questions, and demand answers. Our society has encouraged patients to accept whatever their doctor tells them, as a patient diagnosed with this condition you are going to run into all kinds of doctors. Some will tell you that it is all in your head, some will ignore clues that can lead to a correct diagnosis. Familiarize yourself with every aspect of this condition and become your own advocate. It is empowering and it helps you feel like you have some control over what feels uncontrollable. Acupuncture helped some, and I will still go if the pain gets so bad I can't function. I have used Reiki as well. There was some hope that Cranial Sacral Therapy might help me, but I haven't tried that yet. My skin is hyper sensitive and sometimes touching me can put me into a great deal of pain. I am very careful about that, so no massages for me!! Warm water is my best friend. REST, REST and REST. Understand that your life is all about energy. Resting allows you to conserve energy that you can expend later when needed. I view my energy as little boxes. If a trip to the store is going to use 45 of my 50 boxes for the day, I know that I will have to replace that energy in order to do anything else that day. I rest in between activities and store up my energy according to what I have to do each day. I find a great deal of help in meditation and binaural beats for sleeping and relaxation. Understand your limits and explain them to your family. Enlist their help. Getting your family involved in understanding your condition is KEY. I did not do that until my marriage imploded. I should have explained the medical and emotional implications to everyone around me, but spent to much time feeling angry and sorry for myself. Try not to go there!! Joining a support group is also very helpful. Just hearing that someone else has fallen down just like you did is somewhat comforting. The key here is in knowing that you are not alone. In the spring and summer months, with warmer weather and steadier barometrics I am able to function quite well. What used to be a level 6 on my scale is now a 4. You build up a tolerance to pain and can withstand more than you think most days, but then comes the winter, the cold, the low pressure systems, the rain... Not a good time of year for me. I have trouble walking and spend most of my time warm and in bed reading or doing crafty things with my hands. Yes, I am a firm believer in the power of the mind. I meditate almost every day. I find that SLOW stretching rather that getting out of bed immediately in the morning can sometime help me get more done on a busy morning. Thai chi is wonderful with its slow movements and gentle approach. I love it!! I cut out white flour and sugar from my diet this past year and have noticed a dramatic change. I've dropped 68 pounds so far, my body feels better and my pain is more manageable with my chosen modalities. I have had more good days this past year than bad and I actually had about a week where my pain levels were about a 2!!! I still have stomach problems, but they are not as bad as they were and anything like that encourages me to keep going, keep learning and keep trying to find new activities is a good thing. Taking my focus off my pain, while acknowledging that it is there, is the best way to get through my day! Be kind. Remember, you may not see what is happening inside of their bodies. Everything that a fibromyalgia sufferer does involves the expenditure of precious energy. Be grateful that they think you are worth that extra pain they are no doubt going through. Please do not judge what you can't understand. I'd like to tell them this: "My name is Keri. I have a name, I am not my disease! I am not your Guinea Pig. No, I will not take every experimental drug out there. Never under estimate my intelligence, because chances are I know as much as, or more, than you do about this condition. I am a human being and I am in pain. I am not an addict, I am not playing games. I am deadly serious when it comes to the treatment of my condition and I will be included in any medical decisions made. Don't expect a 10 minute office visit. Expect to give me the time and attention I need and deserve as a patient. Respect my right to question your every decision. This is MY body and I have to live in it." Having worked in a part of the medical community has given me a passion to empower others. Do not sit there and take it. Educate yourself, come to every appointment with a list of questions and symptoms. Take the time to write down what your doctor has to say. If your doctor is not willing to answer your questions, respect your right to fully understand, or questions your motives for the visit, he/she is NOT the right doctor for you. Working WITH your doctor is essential. What relations and activities makes you feel better? I love reading, writing, I enjoy my online support group. My family (my children) are adults, but are only a phone call away and I am blessed with wonderful daughters who come, when they are needed, to help me. Some days I can't navigate the stairs, some days I am so tired I can't fix dinner. Some days I sleep all day storing up precious energy so that I can go out to dinner. I have a therapy bird and he brings me a lot of love and laughter. I carry a notebook with me everywhere I go - I keep one beside my bed, and another where I sit to watch TV. I have to constantly write things down because the fibro fog can get VERY intense and I feel so badly when I forget something important. I am beginning to raise therapy birds for others, and this activity can take a great deal of time and effort, but I love it, and hope other patients will benefit from a wonderful relationship with their own therapy bird! I do not recall (LOL-Fibro Fog??) when I joined, but I spend time on the page reading and chiming in with what I have learned, if needed. I do not feel like a stranger among these people. I KNOW they GET IT and they GET ME! I'm very grateful for the website and the postings on Facebook!! Really good advice. Hope you feel better soon Keri! Wow, great interview! Go, Keri! (I had to go back up to the top to make sure I was spelling that right; I was a writer/editor/proofreader once, but that's gone in the fog.) We need as many advocates with medical backgrounds as we can get.